This is the final Sweet Treat recipe this week – hopefully you have found something amongst all this week’s recipes to make for all the Valentines in your life! I didn’t start out making chocolate dipped Oreos. 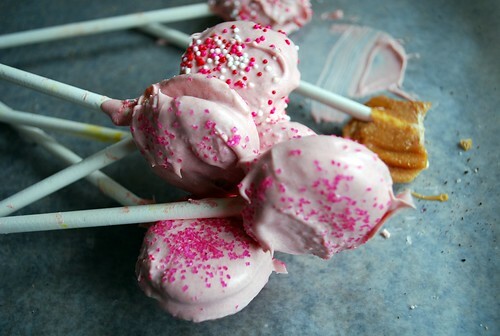 My original plan was to share these yummy looking and sounding “Passion Pops” that were featured in the February issue of Ladies Home Journal. Friend and fellow blogger April had sent me a picture of them and the instructions. A dollop of caramel sandwiched between two Vanilla Wafers and then dipped in chocolate. Sounded yummy to me and they looked darling! A day later April sent me an email warning me that the caramel layer was pretty hard. I decided to give it a try myself anyway – and guess what?! April was right, the caramel got way too hard. I didn’t want to have another caramel tooth yanking episode like I’ve had before so I decided to throw the “passion pops” in the garbage. They looked pretty but didn’t want to risk another tooth extraction. If I ever attempt them again I will make the caramel from scratch using my caramel apple recipe not those square little caramels you buy in the store! I actually pulled the ones I made out of the garbage to take this picture for you! A friend of mine had delivered some darling chocolate covered Oreos on a stick to my daughter earlier in the week so I thought since I had a bag of Oreos in the cupboard I’d give those a try. I quickly realized that in order to get the stick into the Oreo I needed double stuffed Oreos so I ran to the store to get a bag. Well – I didn’t just need double stuffed Oreos I needed thinner sticks! I made this mess trying to get the stick into the cookie! I then tried dipping the whole cookie into the melted chocolate and it just made a mess and looked terrible. I was determined at this point to get something to work so I decided to just dip half of the Oreo into the chocolate so I still had something to hold onto. 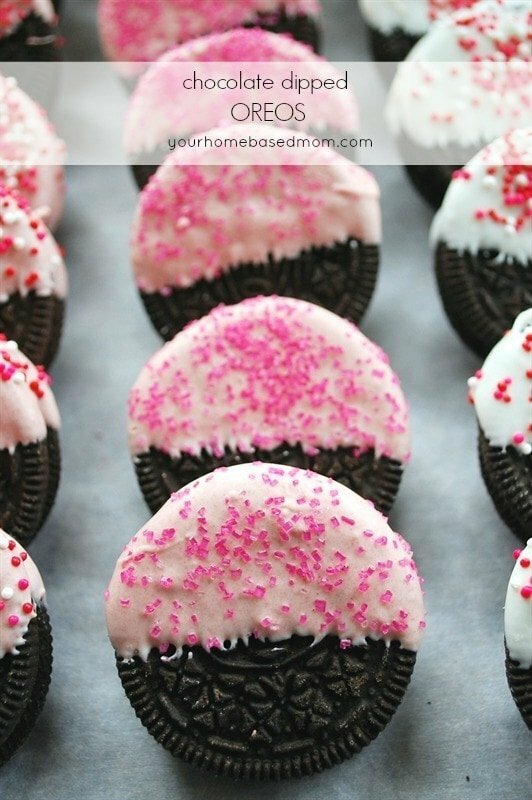 This worked great and I sprinkled them with some Valentine colored sprinkles I had on hand. Finally – success! I used Almond Bark for dipping. I just melted it in the microwave. I added red food coloring for the pink version. I had some cute little Valentine themed Chinese style takeout boxes that I put them in for delivery to friends. So what are you doing for your Valentine this weekend??? Happy Valentine’s Day!! 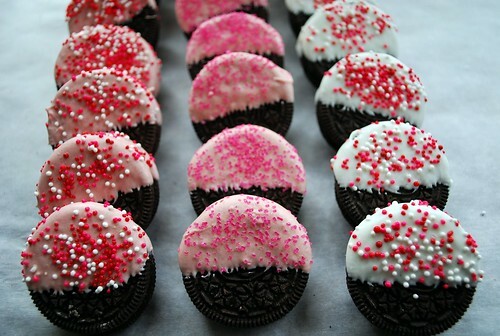 I just love oreos. These look sooo good. I’m just wondering, I hear a lot about almond bark – does that actually taste like almond? Is it good? Rachel » I am not sure why they call it Almond Bark because it does not have any almond flavoring to it – it tastes like chocolate or white chocolate depending on which kind you get. I find that it melts easier and smoother than real chocolate. The only place I’ve found almond bark here in MA is at Wal-mart. Thanks for sharing this, Leah Anne! Looks like fun…& yummy too! Happy Valentine’s! Thanks! I thought so. Sounds so yummy! I just love your blog! These look so yummy, thanks for the idea! And thanks for sharing all of your failures with us so we don’t have to make the same mistakes!! As always, I just love your blog. I saw your post on my friends blog and I just had to comment because I’ve made these and I have a trick for you. You’re right to use the double stuffed Oreos, but the real trick to getting them on the stick is to let the cookies get a little stale. If they are a little soft instead of crispy, then they won’t break when you insert the stick. Also, I use the Candy Melts (get them at Michael’s) and then you can make them in all sorts of colors. So fun! These are my husbands favorites and I make them for him every Valentine’s day. Love your blog, dear Leigh Anne. 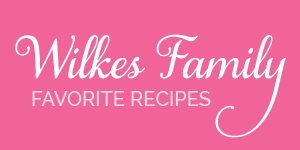 Happy Valentine’s to you and thanks for sharing all the fun recipes!!!!! Way to persevere, Leigh Anne! The final dipped oreos are very, very cute. My husband is out of town this weekend so I’m hanging out with my kids – making some lettuce wraps and california rolls to celebrate. Hope you have a great V-day. How do you and your entire family not all weigh 500lbs? And who has a bag of oreos in their pantry for any length of time? I don’t understand…..
I’m am so impressed with your creativity and persistence. That looks like something even I could handle! They are really cute. Thank you so much for the trick on letting them get a little stale! The only problem is keeping oreos around long enough so they can get stale – at least at our house!!! We made dipped Oreo’s at christmas but dipped them in melted Ande’s mints. 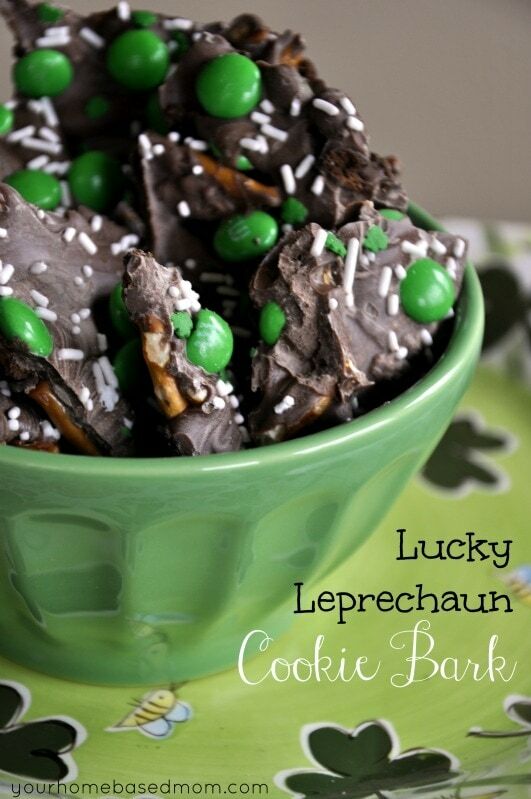 Chocolate and mint….so yummy together! I loved that you shared the fact that “plan A” didn’t work out!! All too often we try to hide the fact that things don’t work out exactly the way we planned! Most of my life ends up on “plan Q” or “plan R” and, like you found, it can still be all good! Thanks for the lesson of enduring to the end. Have a wonderful Valentine’s Day and thank you for always sharing the love!! I love that you didn’t give up! 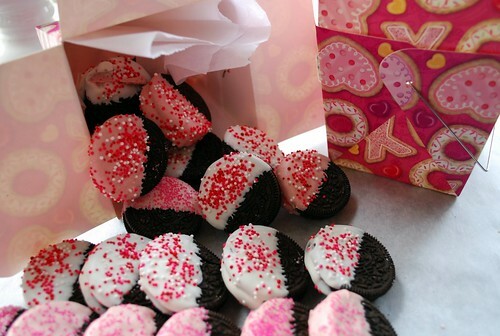 Those chocolate dipped oreos look so good and have me drooling! First of all, YUMMY! I can’t think of any other word! Second, (this is random) How do you write on your pictures that you post? I’m a blogger and don’t know that trick? I would love to learn. Southernseeds » I use the program Storybook Creator Plus from Creative Memories to do the writing on my pictures. It is a digital scrapbooking program. I just found these, they’re adorable! I do have a question, it seems the back looks the same as the front, how’d you dry these? Did you prop them up on something? No I just put them onto wax paper so one side is a little “flatter” than the other. Enjoy! 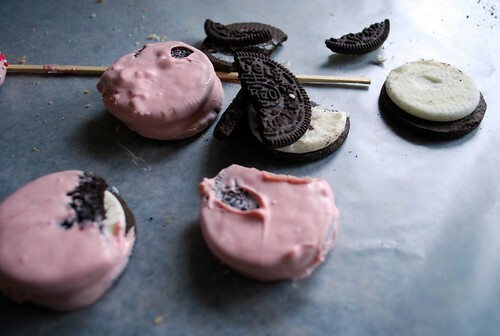 LeighAnne, just wanted you to know that I read another blogger who did the oreo pops and they split them apart and dipped one end of thier popcicle stick in the melted chocolate/melts first then sandwiched between the 2 sides and put in the freezer to ‘glue’ the oreo to the stick. Then they remelted the chocolate and proceeded with the dipping of the oreos. I was planning on doing some this year. I hope thier idea works or I will just dip as you did. Emily, Thanks for the tip. I think freezing it must be the key to getting them to stick together. Let me know how it goes! I tried the oreo pops and they really work well with the melted chocolate as glue to the oreo cookie. Here is a blog reference where I got the idea to glue them to the stick first. Hope that helps and you give them another shot…they are really cute. I absolutely love this idea! My bf’s birthday is coming up and we are throwing a small party; I’ll definitely try this! Looks very yummy! Did I mention I was trying to get an oreo pack from the dispenser machine today and it gut stuck. 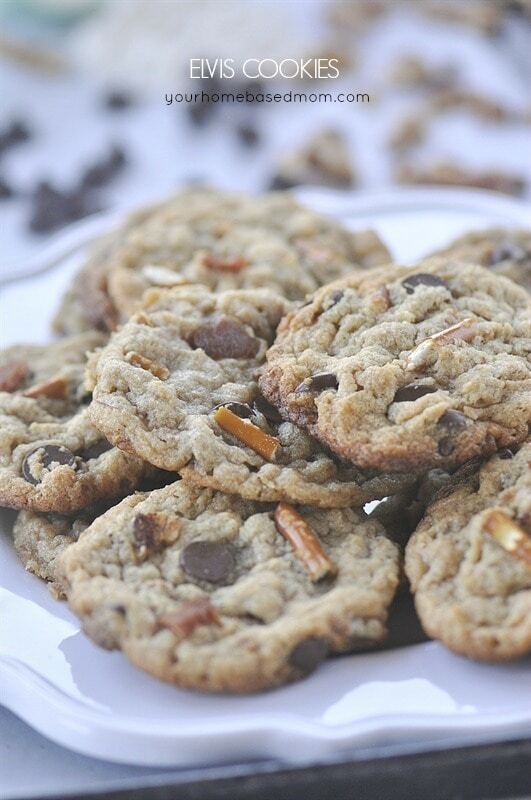 I’m still dreaming about those cookies…. There really isn’t a recipe but the blog post describes how I did it. After the cookie is dipped are you supposed to lay them a certain kind of way? Or does it matter if you lay them flat?? And is it best to add sprinkles immediately after dipping for best results? I just lay then down on wax paper and sprinkle them with the candy right away before the chocolate sets up. 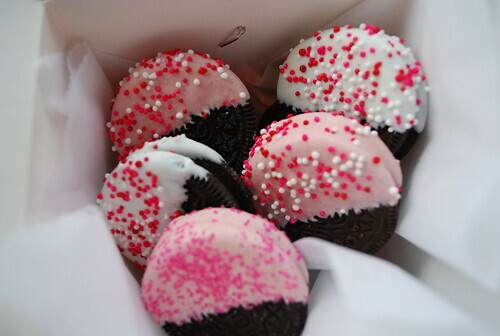 I love these chocolate dipped oreos. They’re especially cool with the valentine theme. I am in the process of putting together a post featuring a variety of foods dipped in chocolate and was wondering if I could have your permission to feature you? I would use one of your photos with a link directly underneath it. I would give no more information about the oreos, so my readers would have to come to your site to find out all about them. You are welcome to use one of the photos and thanks for the link! This is like the story of my life. I am planning to try dipping some oreos before New Years and was pretty sure it was going to be harder than the “dip in melted chocolate and turn with a fork” instructions everyone gives ;-). 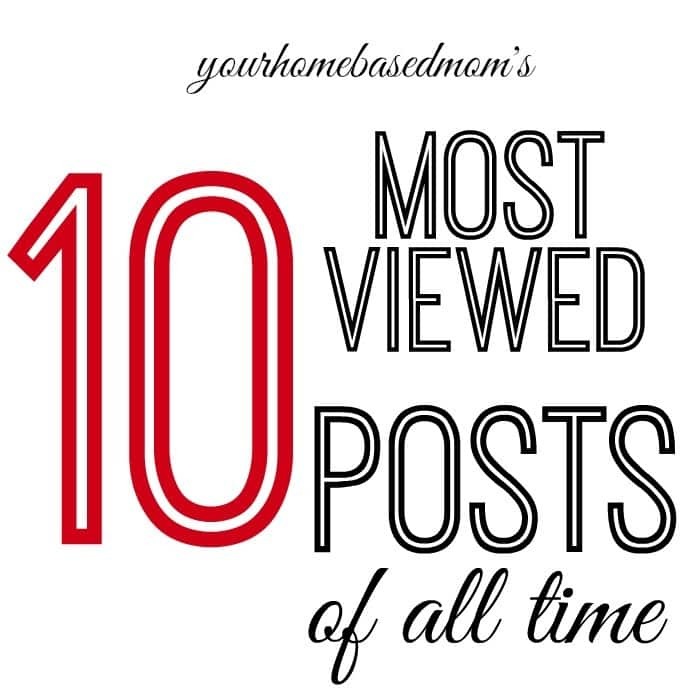 I’ll be posting mine within a week–or not if they fall apart! I put them on wax paper. I did these with my 4 yr old today. They were fun to do and turned out very cute. Thanks for posting the idea.